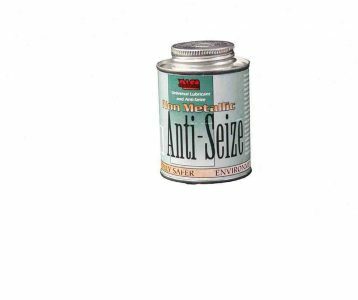 Anti-Seize is a versatile, durable compound with outstanding anticorrosive, rust resistant, water repellent and adhesive properties. Trusted in the industry, Anti-Seize is renowned for its versatility and durability in the most difficult of applications. Anti-Seize prevents seizing and galling when applied to threaded connections, even when subject to temperatures above 2000°F. It permits easy dismantling after long periods of service —saving time, maintenance costs and possible damage to expensive equipment. By reducing wrench torque, Anti-Seize eases assembly and disassembly. Best of all, its multi-purpose properties allow it to replace a wide variety of other products. Its smooth, even texture and adhesive qualities make it easy to apply. Environmentally Friendly Non-Metallic Anti-Seize contains no copper, lead, nickel, zinc or other metals. Non-Metallic Anti-Seize can safely be used on all types of metals including stainless steel and other sensitive alloys where copper is prohibited. Universal Lubricant & Anti-Seize Non-Metallic will be added to Cart!